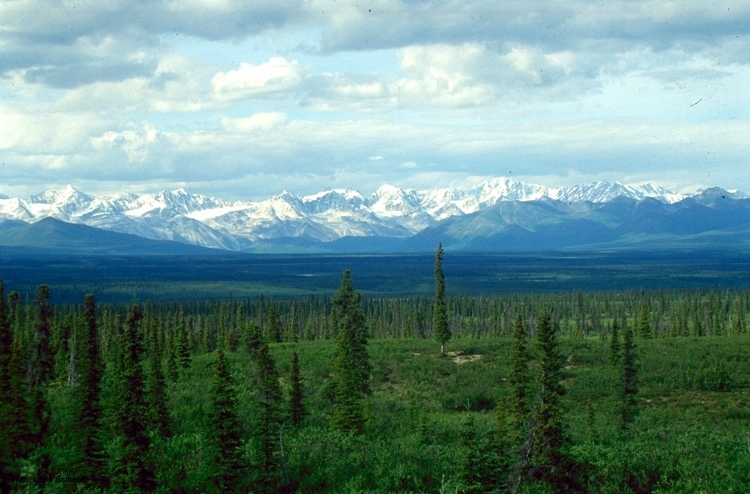 Dominating forested landscapes of Alaska is the white spruce. As a result of rising global temperatures these trees are advancing northward but face an unexpected resistance: the snowshoe hare. Ecosystems are highly sensitive to any changes in environmental changes. For example, a large population of deer may browse on lower vegetation, making a forest floor more open. When there is a low population of deer, perhaps due to a new wolf population, there is less browsing, allowing the forest to be dense with vegetation (Ripple & Beschta 2003). As temperatures rise, the boreal forests of Alaska are experiencing shifts up to higher latitudes and elevation. On the very northern edges of these forests are saplings of white spruce. It is through the white spruce that the boreal forest will be able to expand upward into the barren-looking tundra. Higher up in the food chain on the boreal forest edge are the snowshoe hares. The hare makes its living under areas of dense shrub cover that provide ample amount of food and cover from predators. Their habitat overlaps that of the newly germinated white spruce saplings. The saplings are found here because the shrubs provide a moist area through shading, which reduces the saplings chances of drying out or overheating in the warmer months. These saplings are also a favorite of the hares, especially in the winter months. Hares predominantly feed upon the herbaceous layer (shrubs and grasses) throughout the year but when the snow begins to fall they depend more and more on the uncovered saplings of the white spruce. As global temperatures rise, the growing season elongates. Researchers expect habitats to shift and believe this may lead to numerous interesting interactions, including the white spruce expanding northward out into the tundra. Saplings are vulnerable to many things including hares. Research by Olnes et al in Denali National Park, Alaska, USA attempted to evaluate how the range of the snowshoe hare may affect the expansion of the white spruce. Through observation over the past few years the research team documented hare populations and sapling presence in the national park. Since hare populations often experience extreme shifts in size over the years, they compared their findings to previous decades to look at long-term trends instead of annual variations. In general, they found that the largest populations of hares coincided with time periods where the white spruce saplings fared poorly. And when no hares were present, the saplings grew. Recall that both the hare and the sapling prefer shrub-dominated areas. In these areas the authors observed high rates of sapling consumption whereas in open areas, the saplings were left untouched. That is because the hare wouldn’t risk exposing itself to predators in an open area. While the spruce may be safe from consumption by hares in areas without shrubs, it also faces other stressors such as drying out or overheating in the warmer months that happen when there aren’t shrubs to regulate its environment. The authors concluded that the hares play an influence on the expansion of the white spruce. The hare thins the forest of spruce saplings, changing the structure and composition of the forest and ultimately affects the rate at which the treeline expands. But the authors also notes that the hare isn’t the only thing affecting the spruce expansion. The white spruce is also limited by the distance they can spread their seeds, which isn’t very far, especially into open, dry areas such as the tundra. The authors suggest that herbivores such as the snowshoe hare may influence the distribution of vegetative communities, or in this case, the distribution of entire ecosystems. This impact could potentially become more critical to the boreal forest, as white spruces are either fed upon by the hare or dry out in open areas ultimately dwindling the northward expansion. Will sea level rise harm tidal marshlands?